PRISSMA (Presentation of Resources for Interoperable Semantic and Shareable Mobile Adaptability) is a domain-independent vocabulary for displaying Web of Data resources in mobile environments. The vocabulary is aimed at designing, sharing and re-using presentation information for adaptable mobile user interfaces over RDF data. The Vocabulary does not provide an exhaustive set of properties for resources adaptation. Implementations are free to extend PRISSMA to add further functionalities. What follows is the vocabulary schematic representation. Grey boxes represent core PRISSMA classes. Classic mobile web experience suggests that the same information is not meant to be represented in the same way on all devices. Context-awareness research underlines the influence of the surrounding environment on data presentation. The same principles and best practices apply to RDF resources representation in mobile environments. Works such as Fresnel focus on the representation of RDF resources. Fresnel is a presentation vocabulary for displaying RDF data. It specifies what information show and how to format it. Designed for static environments, Fresnel core vocabulary does not specify under which conditions provide a given RDF data representation. The Adaptation of RDF data to context is therefore left to the application logic, i.e. sharing and re-using contextual conditions for RDF presentation is not possible. PRISSMA vocabulary provides classes and properties to model core mobile context concepts useful for dynamic adaptation of user interfaces for RDF data. PRISSMA models the context of usage of each Fresnel Lens or Format by modeling different dimensions, such as target Users, Devices and Environments. Represents the target mobile user associated to a fresnel:Purpose. To provide more flexibility, the class can be used to model both user stereotypes and specific users, according to the Purpose designer needs. The Device represents the mobile device on which Web of Data resource consumption takes place. It enables device-specific data representation. The class Environment models the user context in which the resource consumption takes place, therefore enabling customized resource presentation according to specific situations. The original Fresnel proposition does not specify the representation paradigm adopted by the user agent. The designer depends therefore on the representation paradigm adopted by the target application. Being able to address this aspect in a declarative way is important in a context-aware environment, where the representation paradigm might vary dynamically. The class prissma:Paradigm models therefore an instance of the Fresnel abstract box model, and it is associated to a given fresnel:Purpose. The class models a Point of Interest (POI) and consists in a simplified version of W3C Point of Interest Core specifications. POIs are defined as entities that "describe information about locations such as name, category, unique identifier, or civic address". 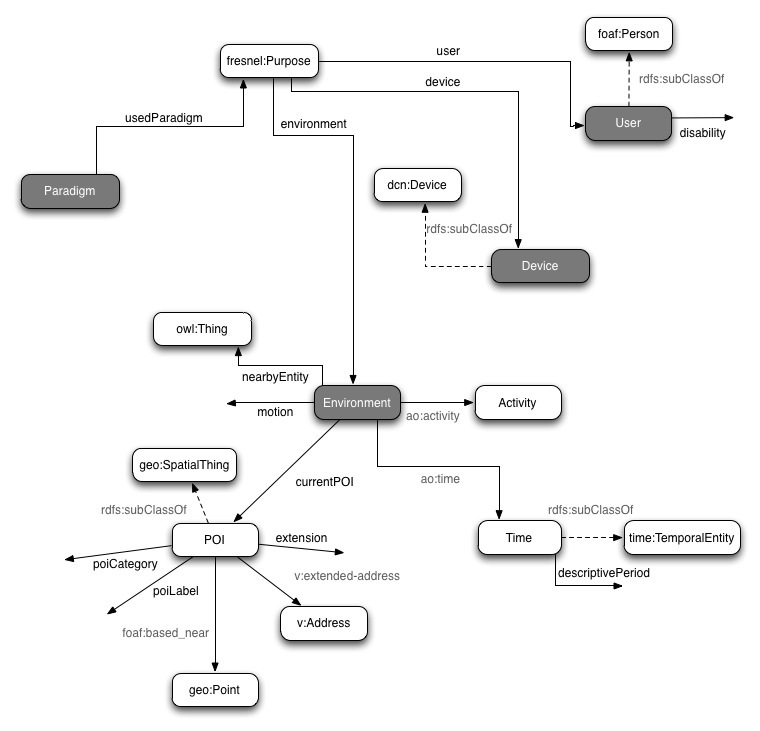 TheActivity class consists in a placemark aimed at modeling a high-level representation of an user action, such as 'running', 'driving', 'working', 'shopping', etc. Time class models temporal dimension. Property used to refer to a descriptive and rather generic period of time, such as 'morning', 'summer', 'weekend', etc. Refers to user disabilities that drive resource presentation on mobile. The environmental proximity of a generic object can trigger different resource representations. The property is therefore used to associate nearby objects to the Environment model. Specifies the geographic extension of a POI. Value is expressed in metres.